My first attempt at wet felting. Creativity comes from within, from the heart and from our surroundings. It is not something which can be learnt but it is something which can be developed and nurtured. I have worked with many students and more recently adults who claim that they are not creative. My response is now as always that everyone has a creative ability but some choose to direct their talents to develop their creative innate ability to a higher level. I am always willing and wanting to have a go at different crafts, spinning and weaving are crafts that I have touched on over the years but for one reason or another never got time or the opportunity to really develop. Now that I have a lovely spinning wheel and recently acquired a tabletop loom I am looking forward to learning to spin on a course run by Wingham Wool Works in July. 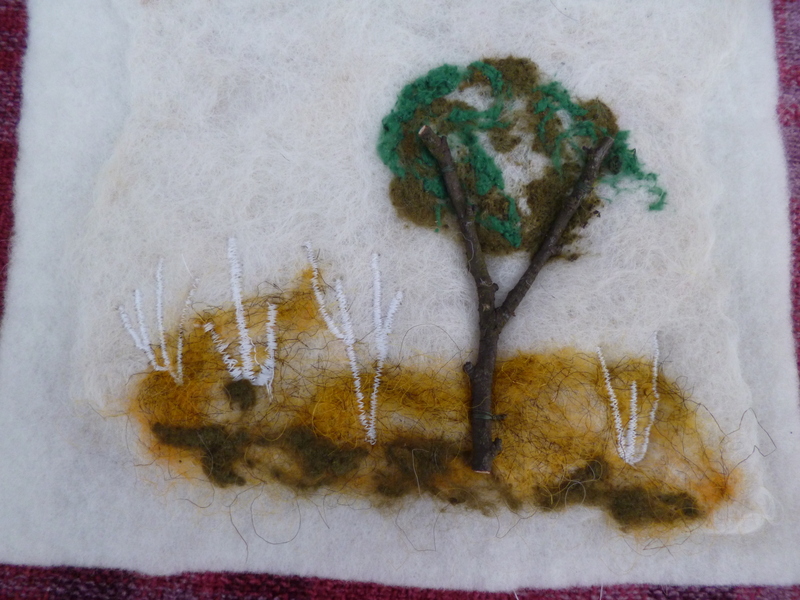 The picture above is my very first attempt at wet felting combined with some needle felting, adding some tactile objects topped with some free stitching. I was trying to create the impression of an English hedgerow.